Here are a couple more that might help. Well thats it hope these help. Sorry I am that kind of mood. Looks good to me and I am sure it will help alot of people. If you take apart the horn button there is a contact that is engaged when you press on the horn.What you are actually doing is sending a ground signal to your horn relay coil which has power at it and to one side of contact.When ground signal makes it to the coil at horn relay it engages and closes contact to provide 12v to your horn.Thus giving you the beep beep sound.I hope this makes sense. Does anyone have more wireing diagrams for 65? Here's the engine, cab, and, tail section. Thanks guys! These look like they'll work. Just sat down and went thru a harnesses for 68 and labelled everything. 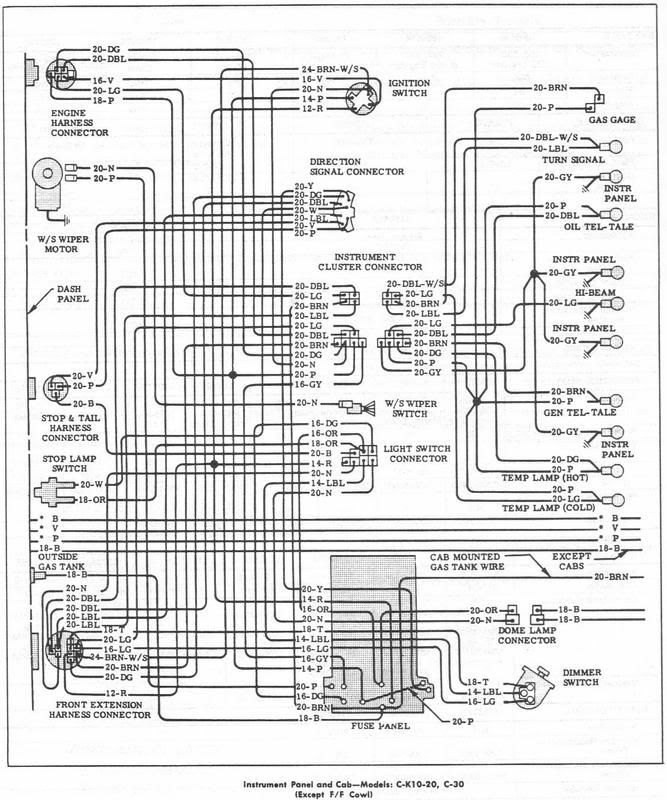 Now to move onto the 60.
where did you get the wiring diagram from? What book? How much was it? Any info would be great i would like to buy it. Thank you! Moving this up into the stickies.
. OK this is what I'm doing i just bought a new stock under the dash fues box with gages .I already have the harness for the gage cluster. What do i.need to do before i take out the old one?And what do i need to do for the new one. Does the.new one plug into the other stock harness? I copied them to a flash drive then went to the local FedEx/Kinkos and had them printed on 11 x 17 heavy stock. It cost less than $7.00, is easy on the eyes and will last for years. Most of the original wiring was missing on my truck. It had been sitting in a field for 30 years or so. If you are going to use the stock dist. with points and don't have or can't find resister wire, this may help. I had trouble figuring out the wiring for the start/run circuit going to the points. The wire is not on the diagram above. As I understand it, the truck came with resistor wire going to the points during run so they would last longer. After much research on my part and the help of my Dad, (he was a mechanic when the truck was new); this is what we came up with. Last edited by ljackson; 01-30-2014 at 05:16 PM.